Most beer drinkers have experienced 'gateway' moments, where they've tried that one beer that has opened their eyes to something completely different, be it a different country, a beer style or something more subtle like a hop variety. Those moments continue to happen for me but this post is about one from many moons ago. 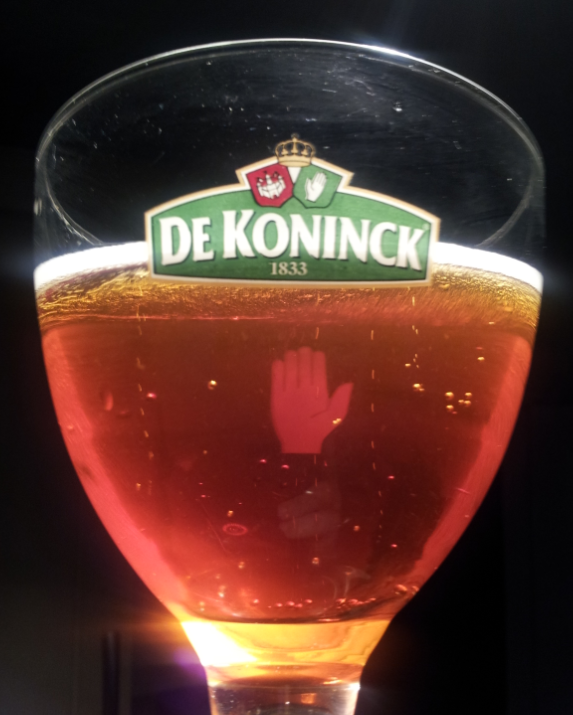 The first time I tried De Koninck was in the Dovetail in Clerkenwell, probably about 8 or 9 years ago on one of many Thursday night beer adventures with an ex-colleague. When we discovered this pub, it was like a whole new world of beers had been opened up to me. I'd had Belgian beers before, usually picking them up out of curiosity while filling the car with cheap lager in Calais hypermarkets, but had struggled to understand them, let alone enjoy them. It was quiet in the Dovetail that night and the barman, who was passionate and knowledgeable, took time to explain the styles and let us taste a few before deciding. One of the beers they had on tap was De Koninck's amber ale. I loved it from the first sip. Yes, I've had many better Belgian beers since but this is one I'll always look out for when visiting. 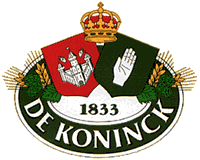 De Koninck is a brewery with a long and eventful history. Having opened in 1833 in Antwerp as 'De Hand' (a hand logo still appears on the bottle and famous 'bolleke' glass), it took on the name it has now when Carolus De Koninck stepped in when its founder, Johannes Vervliet, died in 1845. The brewery changed hands several times through the years but was always family run, until it was acquired the the juggernaut that is Duvel Moortgat in 2010. Other than updated branding (left), its new owners have left the traditional amber ale alone and it continues to be widely available throughout Belgium. In Antwerp, you can order the beer by simply asking for a bolleke. This is the name given to the distinctive glass, shown below. You'll be hard pushed to find a beer bar in Antwerp that doesn't offer a bolleke. It's very much a staple in the city which has a great beer heritage and many fantastic beer drinking establishments (including of course the world famous Kulminator). On visiting for the first time in 2009, the first thing I did on leaving the train station was find the nearest bar in the square opposite and do just that, with a big smile on my face! So onto the beer itself. This was a bottle purchased from the excellent Beer Ritz, for the bargain price of £1.87. The beer is amber as they come. I've tried to show that in the photo (left), in which I'm holding it up to the light (you can also see the hand logo in this shot). The nose is one of banana cake, biscuit malt and some distant floral notes. These aromas carry through to the taste, backed by subtle roasty malt notes and those classic Belgian yeast characteristics. This is not a challenging or complex beer like many of its compatriots. 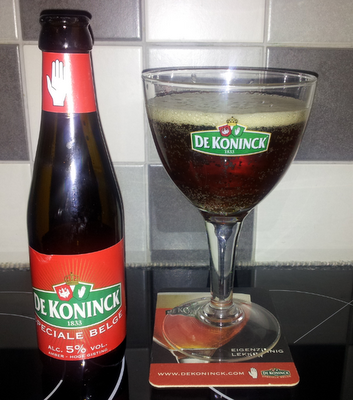 It's an easy drinking, straightforward classic amber ale, weighing in at a modest (for Belgium) 5% ABV. 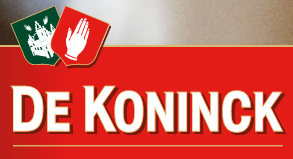 Its big brother, De Koninck Tripel (also known as Cuvee), is an amplified version of the same flavours and aromas, weighing in at 8% ABV. What 'gateway' moments have you experienced in beer drinking? Is there one beer you look back on fondly as being the one that opened your eyes to something much bigger? Good stuff. Frequently had that on a tap in the pub I used to run. We also, rather oddly, used to have a giant bolleke, holding (I think) about six pints. Funnily enough that wasn't in regular use. That sounds great Gareth. Last time I went to the Belgian beer weekend in Brussels, the brewers association guys in the parade had similarly oversized St Feuillien glasses, although they were far from full. Not sure I could drink 6 pints of either to be honest!